Twelve top end bicycles that you can buy for money and the wheelsets they had were recently thrown into mechanical tests by the German magazine RoadBike.de. Which means, lots of interesting figures for you guys with fat wallets and zilch to lose. For people modest with finances like me, I just like to see the data that these state-of-the-art bicycles are putting out these days. Methodologies of the tests maybe read here, if you know German. The bikes were all sub 6.8 kg. The models and the figures they posted are shown below. Observe that Mavic R-Sys, whose notoriety is second only to the spectacular failures it suffered out on the field, posted 5% lower stiffness than the average of the 12. 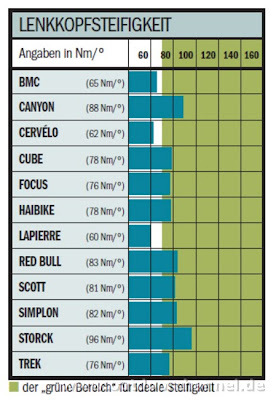 Overall, the Canyon Ultimate was rated the best bike in this test. Readers may recall that last year, I posted stiffness data for Museeuw's MF5 Flax-CF bike. I'm also interested in what another exotic frame - the Delta 7 Isotruss - shows in comparison. So here are those two that I plug into one chart. Really interesting. The Ascent bike is described by the company as "extremely stiff" due to its structure and so light it is "exhilarating". However, the numbers Museeuw's Flax frame has posted put the isotruss slightly down. Both frames are however no where in comparison to the bikes above for bottom bracket and headtube stiffness, although they seem to be relatively more compliant for comfort. The flax bike is second only to the BMC Team Machine in comfort and I wonder if the benefits of the flax are tied into this. This exercise only compares stiffness of these frames. Do remember that stiffness is not the only yardstick by which bicycles are measured. Lot of stiffness is beneficial in some spots but unnecessary in others. Lot of stiffness may suit some riders but not others. See, if stiffness alone were the holy grail of bike design, we'd all be riding on reinforced concrete by now. And you'll need lots of chamie cream for that. Nanotechnology Application In Bicycles : How Good? DT Swiss wheels. Didn't look so good in these tests. I look at tests like these and find it funny how the most expensive bikes and related equipment are highly rated. Are these tests really *independant* or are they trying to move product out the door for someone? Yeah..the Cervelo R3 SL was tested last year I believe. It posted 110 N/mm for bottom bracket and 70 Nm/degree for headtube while comfort was 277 N/mm. It had a Zipp 303 wheelset that posted 87 and 67 Nm/degree for front and rear stiffness respectively. The stiffness doesn't tell the whole story of the bike. You also have to factor in the rider. If you are a 100 lbs light weight female rider, you don't want to be riding the stiffest frame and wheels because it going to beat the snot out of you. However if your joe six pack over at 200 lbs then you definetly want the stiffest frame and wheels you can get. I agree with Alloy Cowboy. You need to further recognize that Tour tests relatively large frame. Stiffness increases further, typically, going to smaller frames. So smaller riders aren't only lighter, loading the frames less, but their frames are naturally stiffer. If I'm leaning into a turn on a descent and hit a bump, there's more than just vertical compliance absorbing the impact. It seems I want a bit of lateral flex as well. Tour divides stiffness into "good" and "bad" components. But perhaps there is an optimal level of compliance in a given mode. Further, frame geometry plays a large role. Obviously chain stay length affects how rear bumps are transmitted, and trail affects how front bumps disrupt steering. Tour totally ignores frame geometry. Heck -- they don't even ride the bikes they rate. So I wouldn't obsess over these numbers. They're interesting and useful, but the frame I ride (Fuji SL/1) ranked 41/41 in its Tour magazine ranking. I'm small, though. Interesting, the two German frames rated the best in the German magazine test. You guys have a point. Expensive bikes and German bikes are being rated the best. Makes you wonder what the real intent is behind all this, doesn't it? Don : I do recognize the pivotal role geometry plays in comfort and handling. Thats interesting, and I'm hardly surprised when you stated the Tour magazine doesn't even ride some of these bikes that they test. Is it true? That's not very "comprehensive" testing is it? A nice little side story on frame stiffness. In the 90's Honda build the RC45 Superbike which had, on paper, everything it needed to dominate the competition. Most Horsepower, stiffest frame, ect . . .
A main contributing factor was the frame was found to be too stiff, and so when the bike went into the corners the frame would chatter over bumps requiring the rider to slow down in order to maintain traction. This issue continued until Honda redesigned their superbike to actually be less stiff. Stiffness is not the primary Key Performance Index to judge a two wheeled vehicle. Ryan : That was a great story actually. Its funny how in cycling, you have these gurus telling others on forums that stiff frames are good for criteriums, compliant frames are good for long distance and so on. Well what if you throw in a few cobbles and bumps into the crit course? Will all that stuffness help you there? Tough call on that one. Germans found standard Italian frames too flexy for their liking. Thiscreated a demand for frames with stiffer bottom bracket areas, so German frame makers started to produce stiffer frames. 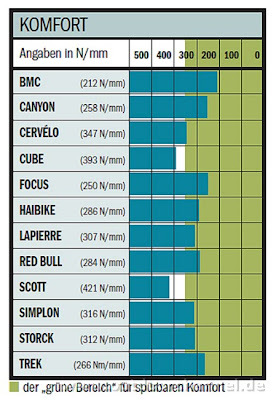 This again made bicycle magazines test the stiffness of the frame, reinforcing the ideal, that a good bike had a high BB stiffness. Since the German bike market is heavily influenced by systematic tests from leading bicycle magazine, this again made the German frame makers make ever increasing stiffer frames (or have the highest stiffness to weight ratio) in order to well in these tests. So it really isn't so surprising that German bikes do well in frame stiffness tests. I'm a little skeptical... it seems weird that the Scott Addict was rated pretty well on comfort--but in most road test reviews (and based on my experience with some of these bikes) it shouldn't have. Trek really bragged about adding comfort in key areas... I wonder if the 2009 Madone scored even less comfortable? 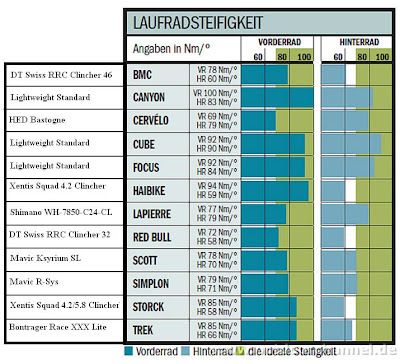 I agree that some of the numbers seem suspect.. some of the German brands scored exceptionally well (ie: Canyon). You'd think they'd get a bigger international recognition if they were *that* great. I have just recently been told that stiffness, the golf shaft manufacturing company in Japan, has developed a carbon frame with an emphasis on deflection. 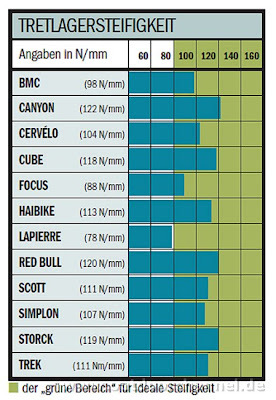 Take another look at the comfort stiffness chart. Scott had the shortest bar because it is the *stiffest* riding bike in the test group. BMC comes in as "most comfortable." 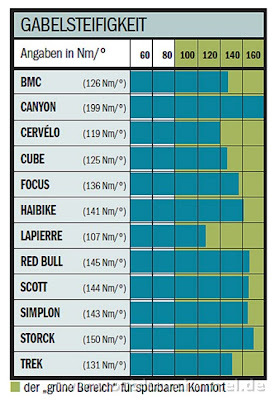 I have ridden several of these bikes and would agree with the results based on my seat-of-the-pants-meter. I also agree about stiffer not being better for most riders. The best riding bike in this test is also the best handling bike in my opinion. Why? Because it is stuck to the road and not bouncing over every pebble in the corners. I am just 60kg so this may not be true for everyone but I also find the BMC to be extremely responsive. Its important to keep in mind that each of these bikes is very high quality and there isn't really a loser in the bunch.